While you may have known about the Google Street View Car, which has 15 lenses taking 360 degrees of photos and lasers capturing 3D data to determine distances within the Street View imagery, you may have not heard of Google Street View Trike. The Google Street View Trike, a 250-pound, 9-foot, human powered machine, enables Google to map sections where there are no regular roads for the Google Street View Car to ride on (e.g. colleges, state parks). 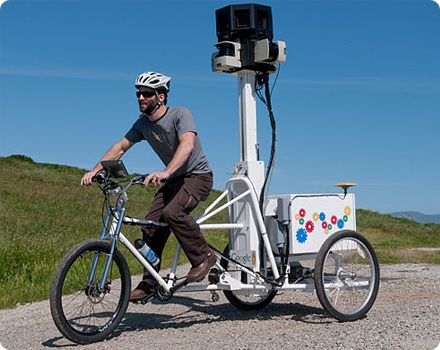 According to Google, one day while mountain biking, Mechanical Engineer Dan Ratner realized he could combine his favorite hobby with Street View to explore new places, and set to work building a bicycle-based camera system. As a result, Google is now able to take the Trike to parks and trails, university campuses, and even sports stadiums. A very cool fact of this Google project is that you can invite the Trike to visit and explore your property in Street View. Throughout this summer 2011, the Trike has been mapping Hawaii’s colleges and state parks. Colin Macdonald, instructor at the University of Hawaii at Manoa, contacted the team to map his university campus and team responded to call. During its visit to Hawaii, the team has mapped several properties such as the Honolulu Zoo and the Kapiolani Community College. 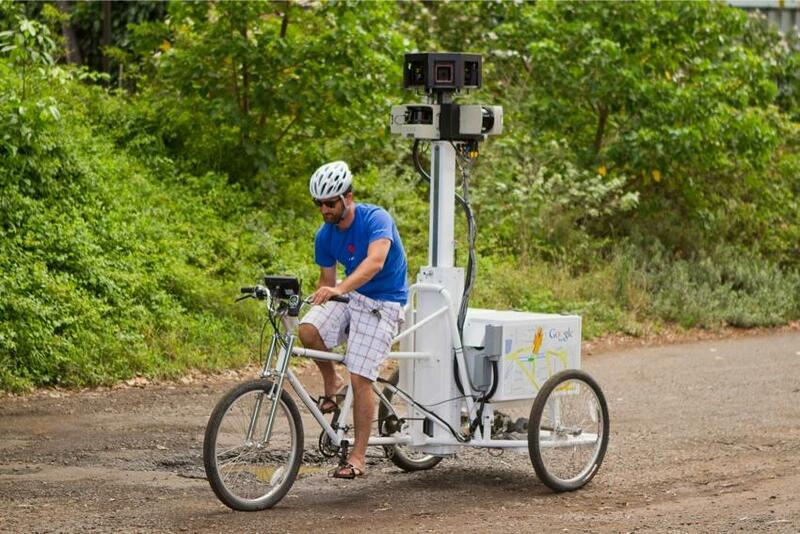 Google Street View Trike mapping out the Manoa Valley in Honolulu, Hawaii. View over 30 photos from the Google Street View Trike team mapping the campus of Kapiolani Community College in Honolulu, Hawaii. Learn more about the Google Street View vehicles (hello Google Street View Snowmobile!). By Damian Davila, blogger covering business and marketing at idaconcpts.com. You can read more articles from Damian at SexySocialMedia here. Follow him on Twitter at @idaconcpts. I love this idea of google for such a machine! Wow, this is awesome! such a cool idea! You can invite it to visit? Way cool! Wow, what an amazing idea! Ride around and get paid for it, whilst creating an online visual world that others can access and share. Cool! you can invite it to your own backyard, good for Google! @Tracy, Sanjay yes, you should try it, we brought it all the way to Hawaii so I am sure they will go anywhere. Oh, this is really cool and unique, and it is the first time I am hearing for it! So, the trike can actually be ordered to explore the area…I bet they have lots of ridding to do in the Google in order to map all the non-regular roads that don’t exist on their maps so far. It is great to know they are investing so much into their business-they really are serious about it…so, thumbs up for them! No wonder why Google is number one in practically everything nowadays! Yes, in the case of Hawaii a professor from the University of Hawaii at Manoa contacted Google about it. Of course, Google had to line up a couple of visits to other places such as the Kapiolani Community College, the Honolulu Zoo and others. I heard that they are still around here. I don’t blame them, it’s beautiful out here. @James and Andrew Glad you guys enjoyed the article. The Google Trike was all around town during its visit and several local tech bloggers got a chance to take plenty of pictures.